Does your business run two instances of Microsoft Dynamics GP? If you’re doing business in more than one region, the answer is likely yes. However, sometimes having multiple instances can cause errors you might not normally see. 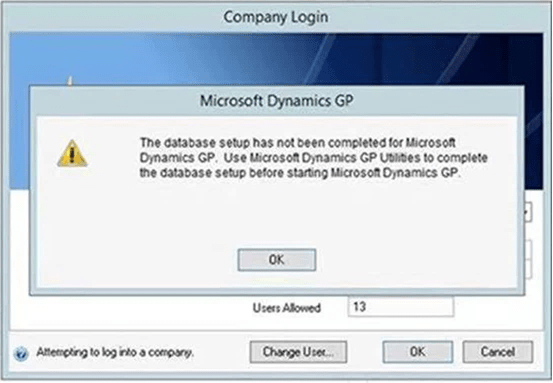 One instance in which I encountered this error was while helping a client who had a United States instance of Dynamics GP as well as an Australian (AUS) instance of Dynamics GP. This error would only occur for the client when they attempted to log into the company from the AUS GP Client. Although Microsoft has created a Knowledge Base article that normally resolves this error, we ran into a few problems while attempting to solve the issue. Referring to Microsoft’s knowledge base article, we could not locate the sub-feature that was specified. After reviewing the DYNUTILS.SET file and comparing the US client to the AUS client, there seemed to be no noticeable differences. We also found no differences between the RDS client and the Server client sub-features. As a last resort, we ran a repair. When this process was completed, the GP Utilities Window on the AUS client prompted us to “Upgrade the following companies?” referring to the US Companies, the Australian Production database, and Australian Test database. There were also three Test Companies that did not need to be upgraded. why it was prompting me to upgrade companies that were already accessible in addition to the new company on the AUS client. Also, why were the Test Companies okay? I decided not to complete the upgrade process and began to investigate the issue. This table held all GP databases with Product IDs and their version builds. In reviewing the table, I compared the US companies to the new AUS company. What I noticed was that the AUS companies were missing product ID 2199, Business Activity Statement. While the US companies were missing product ID 5967, Fixed Assets Enhancements. What this told me was that the above error was misleading as it did not call out a mismatch in product versions or that products could be missing from the new GP company and previously setup companies. After conferring with Microsoft Support, I learned that these are default modules that should have been installed when the companies were originally setup on the AUS client. However, these are not products you can select during installation. Since Step 4 in the Microsoft Knowledge Base article didn’t work I knew that my DYNUTILS.SET file was somehow incorrect. To solve this, I reinstalled the Australian GP client on the SQL server, selecting only modules needed for the Australian instance. After reinstalling Dynamics GP AUS instance, I ran through GP Utilities and upgraded the companies. This added the necessary modules to both the US Companies and the new AUS company. I was then able to login into the new company on the AUS instance and confirmed that the change was made to the DYNAMICS.SET to add the proper default products. To avoid this issue, if you have two instances of Dynamics GP it is best to add a new company through GP Utilities for one of the instances and to immediately run GP Utilities on the other instance. This will establish the proper modules necessary for that client to access the new company. If you have questions about this issue, Dynamics GP, or any of our other products, simply contact us using the form below. FMT boasts excellent customer service, support, and more. We’d love to hear from you!